Night Train | A Guy, A Girl, and a Really Old House! ← Szia (See-ya) from Budapest! On Wednesday evening we lugged our bags back to the train station for the trip to Zurich. Months ago we’d researched flights and trains between Hungary and Switzerland, but the airlines took more than 12 hours to get there with connections, so we decided on the overnight train, rationalizing that the extra expense (over a regular train) would make up for itself in time to see and do things and the saved lodging expenses. Since Tony is quite tall, he really struggles in small spaces, so we debated back and forth about coach vs. sleeper. The middle ground, price-wise, seemed to be a couchette, or a compartment with 6 beds that fold out from the wall. We arrived at the station that night with all our luggage (a backpack and hand luggage for Tony and myself, two backpacks and a big suitcase with stuff from Nepal for Amy) and looked for our compartment. It was a touch smaller than we expected. There was one person already in the compartment, sitting in the center of three seats on the left with three other seats facing her. In the space in front of her was a small carry-on roller bag and a large rolling suitcase… and no space for any of our stuff! After several moments of stunned staring we jumped into the process of storing our own bags for the journey. The two upper-most beds were already folded out. (The others were all packed away, since they double as seats during the day.) 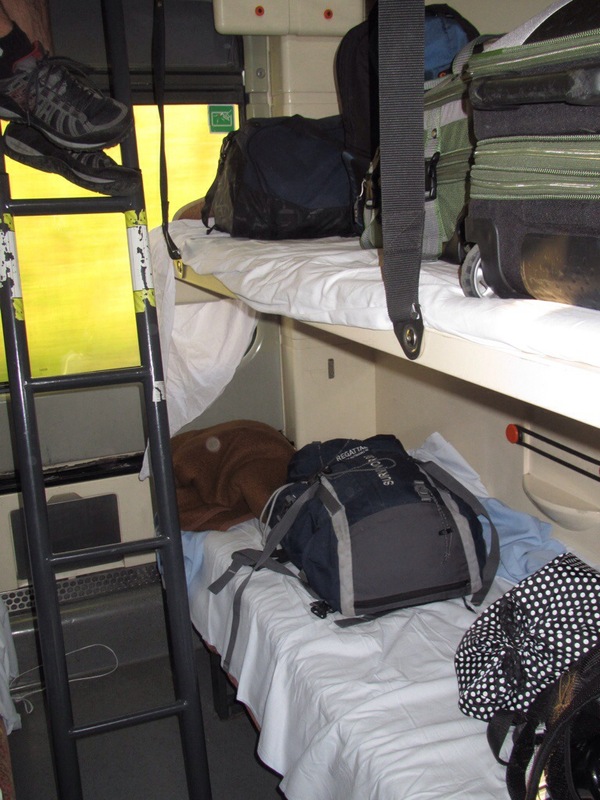 After considerable jostling and deep breaths, with our compartment-mate just sitting there watching, she informed us there was a cavity up above on the level of the top bunks, essentially over the hallway, that could be used as storage. I schlepped my way up there as Tony handed me bags. Amy stuffed backpacks and smaller bags under the seats. The whole time our compartment-mate just sat there, often with someone else’s tush in her face! It probably took 20 minutes to get everything settled so that we all had a seat and no luggage was out in the hall. The train started moving, and we all, compartment-mate included, breathed a sigh of relief. Then we made our first stop. With each new train passenger that boarded, we held our breath, sighing with relief as they passed by our compartment. That was, until one couple didn’t pass by. They stood in the hallway, looking into our compartment… With 5 bags at their sides! So the process of moving and shoving started all over again. Amy decided she would crawl up to the top bunk with as much of her luggage as we could lift up and just stay up there. That way the rest of us could have a seat. But the new couple was not happy with this decision. They were assigned the top two bunks, and they didn’t want to trade. So Amy’s bags came down. Amy came down. The new couple went up, with the wife angrily scolding her husband in some foreign language. She was not happy with whatever was happening! After awhile we just started laughing at the craziness! Thus began our night aboard the train! Those feet are our Spanish friend’s on the top left bunk. He was actually quite friendly and thoughtful. His wife didn’t speak to any of us during the 12 hour journey, including the young Hungarian girl. Anyway, I couldn’t get a photo that got all the bunks in! Sleep was intermittent as the train shuddered up and down mountains, stopped in towns along the way, and people went in and out of our compartment door… Which had 4 locks to be done and undone each time! You can see from Amy on the bottom bunk that space was tight! Still, it beat the bobbing head and sore neck we’d have had in coach. The next morning we arrived beautiful Switzerland and ate our chocolate filled croissants and juice breakfast while looking over glassy lakes, green hills, and even a few snow capped mountains! This entry was posted in Vacation and tagged Europe. Bookmark the permalink. Ya gotta love the train! I know to most that might sound unpleasant but the train…ah, the train!! !